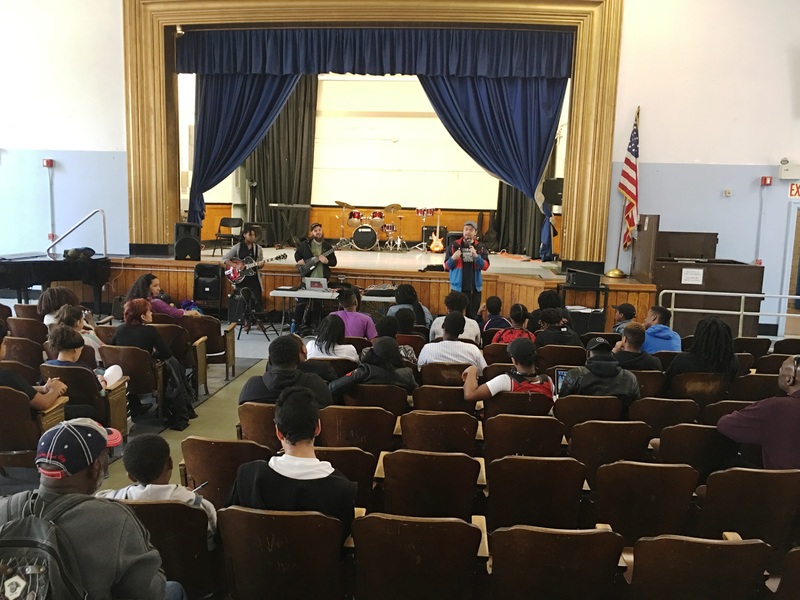 During the last week of March and the first week of April, Pamela, Baba, and Yako conducted 1.5-hour mentoring sessions with each of the 10 participating student musicians/groups at various Beacon, Cornerstone, and SONYC afterschool sites in Queens, Bronx, and Manhattan. These sessions were dedicated to providing students with constructive feedback, critique, and guidance as they continued to work on their original songs. The participating sites in this program were: Quest Youth Organization (Bedford-Stuyvesant), Moshulu Montefiore Community Center – Evander Campus (Gun Hill), The Child Center of New York (Flushing), Long Island University – Advantage Higher Education (Downtown Brooklyn), Southern Queens Park Association (Jamaica), Greater Ridgewood Youth Council at York Early College Academy (Jamaica), Harlem Children Zone (Central Harlem), Johnson Community Center (East Harlem) and Phipps Community Development Corporation – Beacon @ IS 192 (West Farms). After these one-on-one artist mentoring sessions, students and faculty gathered at Countee Cullen Community Center, a program of the Harlem Children’s Zone, Inc. housed in PS 194M in Manhattan, on Monday, April 10, 2017 from 11:00AM to 4:00PM for a collective “mentoring day” with all of the teaching artists. “Beyond the Voice” will culminate with a student showcase scheduled for Saturday, May 20, 2017 at JCC Manhattan. AH Program Coordinator Kiran Rajagopalan had the opportunity to attend this “mentoring day” and he witnessed these students’ brilliant musicianship and their eagerness to learn more about taking their art to the next level. 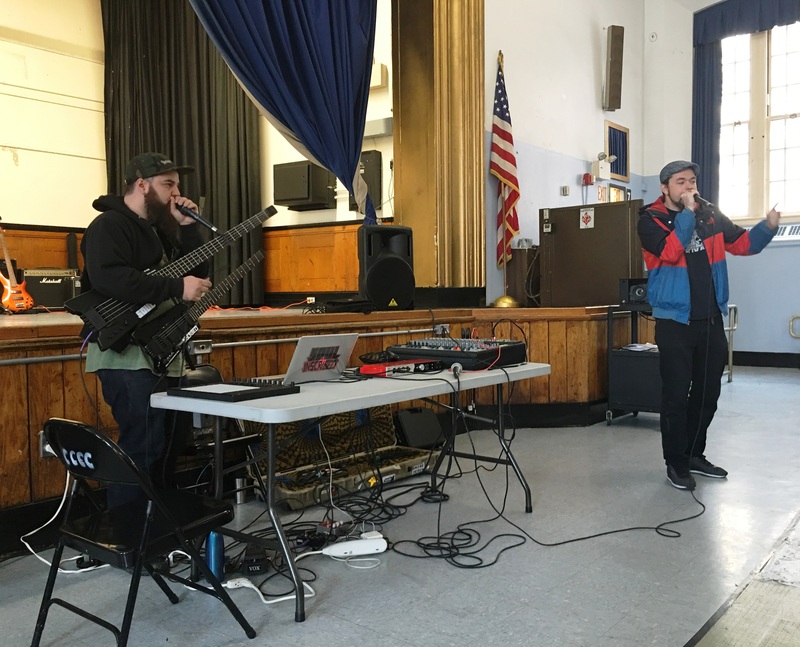 Baba, a noted Hip-Hop MC, began the day with a lecture-demonstration on freestyle and improvisation with the assistance of Yako, a talented music producer and multi-instrumentalist, and several students on guitar. Performance artist and dancer Dawn Crandell then conducted a movement workshop in which students were taught exercises improve their stage presence. Students were first asked to state their name and to come up with a single movement which best expresses their “current state of being.” This was followed by exercises on nervous mannerisms and “what not to do on stage” that were particularly engaging and illuminating. In the third session, students presented rough cuts of their songs for feedback and critique from the teaching artists. Baba also facilitated a discussion with each student about the creative process involved in crafting his or her song. Following lunch, soul vocalist and vocal coach Grace Galu led students through a series of vocal warm-ups that can be done quickly before rehearsal or performance. She also stressed the importance listening through exercises with harmony and a round-robin rendition of an African chant. The reminder of the afternoon was dedicated to the teaching artists engaged in one-on-one sessions with the students in groups. Dawn worked with two students on incorporating movement into their duet performances while Pamela, a prolific jazz vocalist and violinist, worked with another student on crafting a hook for her song. Yako worked with instrumentalists on stage to tighten up several songs that had played for earlier, and Grace worked with soloists on vocal projection. Baba, as the primary organizer and facilitator, oversaw all of the groups and began setup for the final professional development session. The mentoring day ended with Baba leading a workshop on lyric writing with figurative language, beatmaking, and music production with the assistance of Yako. This was followed by an essential, but brief professional development lecture on copywriting, royalties, promotion, and liabilities by Baba. Although scheduled to end at 4:00 PM, the session lasted until 4:20 PM with students fully engaged! The Museum of Interesting Things, one of our new assembly groups will be doing a free show for a Night Out Against Crime hosted by the NYC Police Department 9th Precinct and the Manhattan community. A Night Out Against Crime is an national event but Denny Daniels and the Museum of Interesting things is more than happy to bring their hands-on exhibition locally to New York City every year. 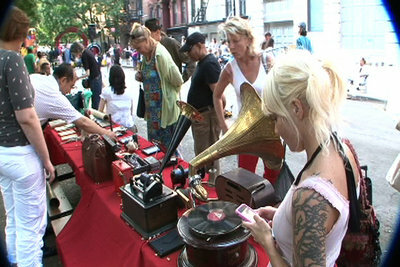 The event will take place Tuesday, August 2, 2011 from 3 – 8pm. Daniels and the Museum will be there until 7pm. The NYC Police Department 9th Precinct is located at #321 East 5 Str. between 1st Ave & 2nd Ave Manhattan. The event will be held in the park across from the precinct. 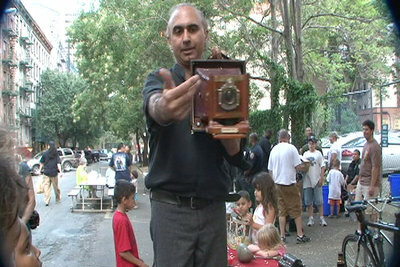 The Museum of Interesting Things travels to almost any location, such as schools and hospitals. This traveling exhibition highlights antiques and cool inventions in hopes of inspiring kids to learn and become more creative. Join the 9th Precinct, the community and museum as the work together to better the education system by promoting creativity and innovation in our youth. See Denny Daniel’s and The Museum of Interesting Things in action and bring the show to your school, theater or community organization. To learn more about the Museum visit the website or read about it in our new digital brochure. To book the show, click here for the online assembly inquiry sheet.